Thank You for registering for the sixth BOX Showdown of 2018. We are excited to heading back to one of our most popular venues for DH and Enduro Racing, it seems to be a popular choice. There will be a Thunder Mountain paper waiver at registration and everyone needs to fill that along with the entry form and ESC waiver. Downhill racers will be racing on Juggernaut to Schist, the first time the Maxxis ESC has used this trail for DH racing ! All Racers that want to compete in the BOX SHOWDOWN must sign in on the BOX SHOWDOWN Entry Sheet at registration. Failure to do so will exclude you from the competition. Please don’t forget, we really want you to be happy. Back is the FOX Seatpost Climbers Challenge. We’ll award the fastest amateur a FOX Transfer Seatpost and the fastest in every class some cool FOX Socks. Remember you have to chip in and out on the climb. The ALEX RIMS Super Stage is back too! This competition awards the fastest amateur male and amateur female a pair of Alex Rims Volar rims, it will be contested on STAGE 4. 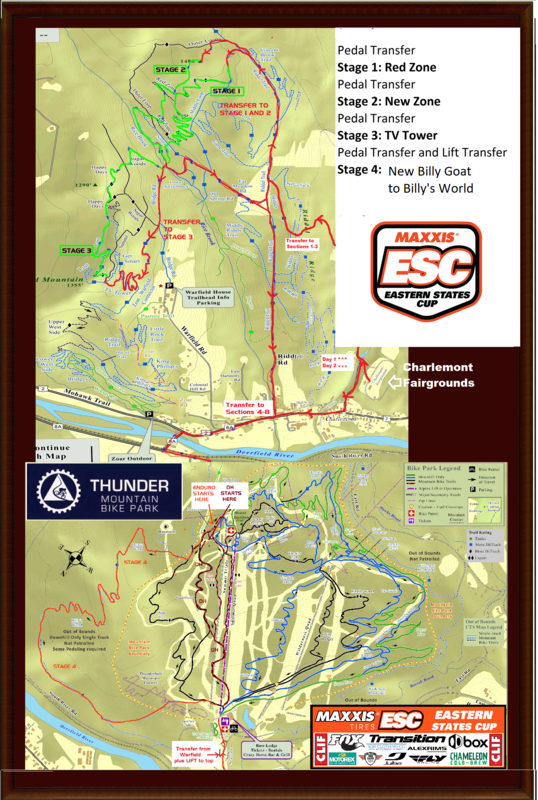 We have a new race trail at Thunder !! We will start on Juggernaut and finish on the lower portion of the Schist. FRIDAY – $30 pass available from Thunder. Courses will be marked. No registration. CAMPING – Camping for the ESC Box Showdown is at the Charlemont Fairgrounds. We will be holding an event at the Charlemont Fairgrounds and participants will be able to overnight there on Friday and Saturday for the event. The fairgrounds will be open starting at 6pm on Friday. There is a $10 venue fee for the weekend, cash only. No alcohol, open fires or fireworks are allowed at the fairgrounds. We will have a fire pit to hang out at and are planning a foot down contest and other activities Saturday. No electrical or RV hookups exist, but it is a beautiful old New England fairground with plenty of places to park your rig or setup a tent. A number of people have asked about setting up pits at Thunder Mountain for the weekend or driving down a camper during the day. People are free to set-up pits or park their RV in the parking lot during the day on Saturday and Sunday. If leave your pit set up on Saturday night, please know you do this at your own risk and Berkshire East nor ESC are not responsible for any personal belongings. Directions to Charlemont Fairgrounds: The fairgrounds are located .25 mile on 8A north off of route 2. Follow 8A until you come to a covered bridge (Bissell Bridge) and take a right up the hill before crossing the bridge. Most GPS devices should find Charlemont Fairgrounds if you search. Don’t type in the actual address as it will not lead you where you need to go. NUMBER PLATES– Will be sold at registration for $10 each. A 2018 MAXXIS ESC Number Plate must be affixed correctly to your bike always while on the tracks this weekend at Plattekill and your lift pass must be visibly attached to your bike. You will not be allowed to ride without both. No cuts or trimming allowed on the plate please. FOOD Thunder Mountain’s kitchen will be open for breakfast and lunch, their egg sandwiches are pretty darn good. SAFETY – Thunder Mountain Rescue.